In studying the intricacies of the atom, it is important to remember that the negative electrons in the atom are attracted to the positive charge of the protons. This is roughly analogous to the centrifugal force of planets pulling the planet away from the sun, but also the attractive force of the sun’s gravity pulling on the planet. Imagine planets falling continuously into a kind of warped gravitational space. All atoms have one or more valence electrons. It is important here to distinguish between the planetary model and actuality, as language and visuals allow us to get closer to how an electron actually behaves. 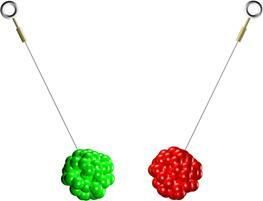 Valence electrons, in the last shell of an atom, can bond with and travel into other atoms’ shells. We call this migration of electrons through compounds current flow, and we will explore this further in Chapter 3. Current flow is the free movement of electrons through a conductor. In most atoms, the proton and electron charges cancel each other out, which gives the atom, or large clumps of atoms, no net electrical charge. Nevertheless, electrons can break free of atoms and migrate to other atoms in compounds and elements. When clumps of atoms are exposed to friction, heat, and light, it induces the electrons to jump from one atom to another within the material. When an electron is removed from an atom, the atom becomes a positive ion, because there are now more protons in the nucleus, and the positive protons outnumber the negative electrons in the atom. When an electron is added to an atom, it becomes a negative ion, because the electrons outnumber the protons in the nucleus. This ion now has a net negative charge. For example, when we remove the one electron available in a hydrogen atom, we get the simplest positive ion, which is just a proton. The law of electric charges tells us that when we have two ions of the same charge, like two positive ions, they will repel each other. 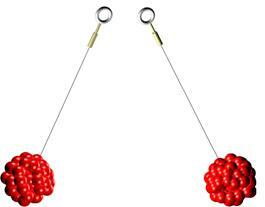 The law of electric charges states that two ions with like charges repel each other. Here, we see a mass of many atoms with an excess of protons in both clumps. This same law also tells us that if we have two unlike ions, a positive and a negative, they will attract each other. Perhaps our grandmothers were correct in saying that “opposites do attract”. This process of having clumps of positive and negative ions interacting with each other through attractive and repulsive forces is one of the primary methods by which we manipulate electrical charges, and these invisible forces have been exploited and utilized to a great degree by artists for many years. The artist Takis Vassilakis, who is a pioneer of kinetic and energy art, created numerous sculptures and installations utilizing magnetics. Vassilakis is completely self-taught, and in 1960 he produced a very large installation called Telemagnetic at the Alexandre Lolas Gallery in New York that involved numerous series of forms that were magnetically associated. 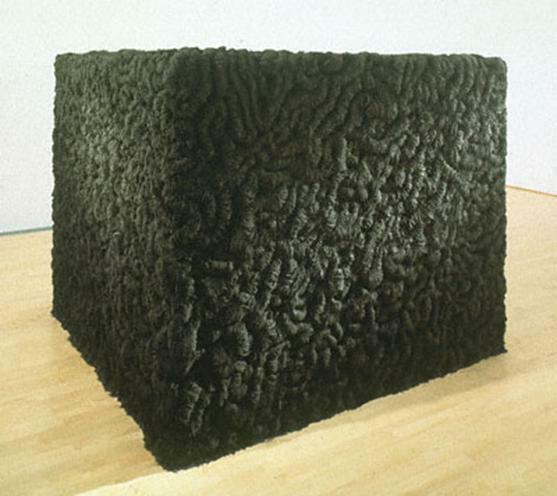 The contemporary artist Mona Hatoum has created a large scale work that involves magnetics and iron filings called Socle du Monde (1992-93) which is a large cube covered with the filings that demonstrate the complex magnetic forces and fluxes that can mix iron filings in a spectacular array of curling forms.